The U.S. Census reports that poverty has increased in America over the last four years. Yet, under the policies of Barack Obama, between 2010 and 2011, 2.2 more Americans joined the ranks of the impoverished. the number of people with income below the poverty level increased by 2.2 million, while the poverty rate increased by 0.6 percentage points. 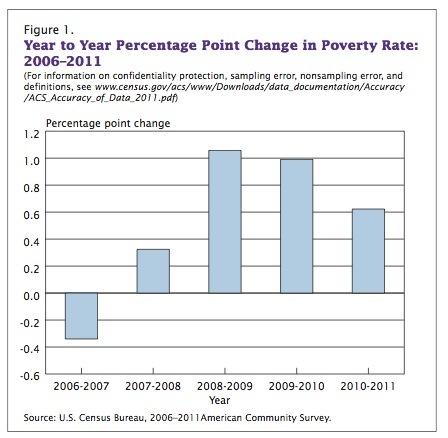 This was the fourth consec- utive increase in the poverty rate, but the percentage point increase was smaller than the increases between 2008 and 2009 and between 2009 and 2010, which were 1.1 percentage points and 1.0 percentage point, respectively (see Figure 1).2 See the Census Bureau report here. So, the question is, will a majority of Americans vote for or against their economic futures?